Today, July 7, marks the 6th anniversary since Pope Benedict XVI issued the Motu Proprio Summorum Pontificum in 2007. This historic papal act, one borne from immense pastoral concern and liturgical necessity, was in many ways the culmination of years of reforming the “reform” of the post Conciliar Church. The Roman Missal promulgated by Paul VI is the ordinary expression of the ‘Lex orandi’ (Law of prayer) of the Catholic Church of the Latin rite. Nonetheless, the Roman Missal promulgated by St. Pius V and reissued by Bl. John XXIII is to be considered as an extraordinary expression of that same ‘Lex orandi,’ and must be given due honor for its venerable and ancient usage. These two expressions of the Church’s Lex orandi will in no any way lead to a division in the Church’s ‘Lex credendi’ (Law of belief). They are, in fact two usages of the one Roman rite. It is, therefore, permissible to celebrate the Sacrifice of the Mass following the typical edition of the Roman Missal promulgated by Bl. John XXIII in 1962 and never abrogated, as an extraordinary form of the Liturgy of the Church. Up to our own times, it has been the constant concern of supreme pontiffs to ensure that the Church of Christ offers a worthy ritual to the Divine Majesty, “to the praise and glory of His name,” and “to the benefit of all His Holy Church.” Since time immemorial it has been necessary – as it is also for the future – to maintain the principle according to which ‘each particular Church must concur with the universal Church, not only as regards the doctrine of the faith and the sacramental signs, but also as regards the usages universally accepted by uninterrupted apostolic tradition, which must be observed not only to avoid errors but also to transmit the integrity of the faith, because the Church’s law of prayer corresponds to her law of faith.’…But in some regions, no small numbers of faithful adhered and continue to adhere with great love and affection to the earlier liturgical forms. 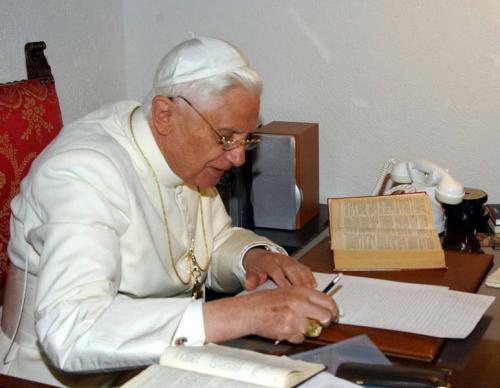 During the first year of his pontificate, Benedict referenced the hermeneutic of continuity versus the idea of rupture that many modernist have been promoting since the issuance of the Mass of Paul VI in 1970. With the release of Summorum Pontificum 6 years ago today the Church clearly confirmed the idea of liturgical continuity between the pre-Vatican II Church and that of the post Conciliar Church. As one who is blessed to attend a parish which offers both forms of the Roman Rite since 2007, I am forever grateful for the Holy Father’s actions. Posted on July 7, 2013, in liturgy. Bookmark the permalink. Leave a comment.